Joining Owens is Tommy Lasorda, Vin Scully, Jaime Jarrín, Fernando Valenzuela, Carl Erskine, Don Newcombe, Steve Garvey, and Ann Meyers Drysdale, widow of Hall of Fame Dodger pitcher Don Drysdale. 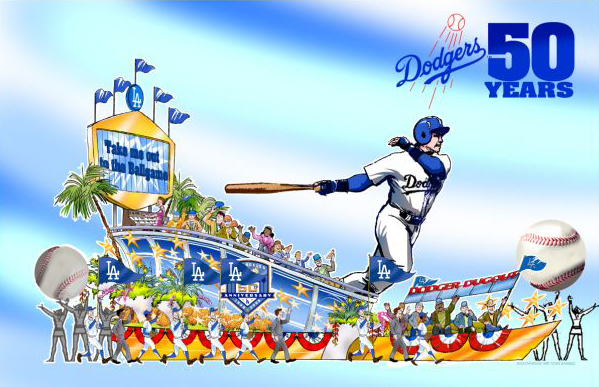 I also like how Dodger organist Nancy Bea Hefley will play live on the float, designed to be the opening pitch for the 50th anniversary celebration of the Dodger's move to Los Angeles. Also riding is Billy DeLury, a 58-year Dodger employee who worked Ebbets Field, the Coliseum and Dodger Stadium. Dodger Stadium is the backdrop, and a nice touch is the scoreboard even if it doesn't have the throwback Union 76 logo seen for years. The 35-foot tall Dodger player is, according to float designer Craig Bukowski. "in the middle of a grand slam swing" that is bound to inspire ooohs and aaahh from the crowd, and ridicule from LA Times Sports columnist T.J. Simers, who is known to prey on Dodger spin. Warning: If any parade-goer want to and pick a white mum, red carnation, or blue ribbon iris from the float, remember "Peanut Guy" Owens has a very accurate arm and can peg a bag of peanuts from behind his back 15 to 20 rows away. BTW, James Loney and Nomar will also be riding on the float as well. The Militant likes this; it's as if the Dodger season begins on Jan 1! Even better than a Rose Parade float, the Dodgers announced they will play an exhibition game against the World Champion Boston Red Sox next March 29 at the LOS ANGELES MEMORIAL COLISEUM! For baseball fans in this town, a definitive chronological dividing line exists between those old enough to remember a game played in the Coliseum and those, like me, to young to have witnessed Wally Moon launching a "Moon Shot" over the 40 ft. screen erected to serve as the left field wall 250 ft. from home plate. Considered a "travesty of the noble game" and derided as "O'Malley's Chinese Theater", it still is a layout I have always wished to have seen in play at least once so this game will truly be a gift for folks like me. With all the heavyweights like Vin Scully on hand today to make the announcement, my favorite comment was passed on by a member of the Coliseum Commission who quipped "We always figured the Dodgers would beat the NFL in the race to return to the Coliseum".